Reading is a weird, personal experience. Likewise deciding what to read. Once I’ve settled on a book (enticed by the cover art, title, summary, author or the recommendation of someone I trust) my strange behavior escalates. I tend to avoid (or at best, skim) reviews of the chosen book. And after I’ve made a decision not to spoil a book for myself, years may go by, I may even change my mind about reading it, and still steer clear of reviews. It’s slightly obsessive behavior, but it’s just standard operating procedure. So: The Castle Behind Thorns. I loved Merrie Haskell’s middle grade debut The Princess Curse, but her following book, Handbook for Dragon Slayers, didn’t strike my fancy. Still, I’ve been waiting on this third Haskell title since last year, but I’ve been pretending reviews didn’t exist. I didn’t even let myself dwell on the summary. Once I started reading, though, it was all enchantment, and I hardly looked up until I’d finished the book. When Sand wakes up alone in a long-abandoned castle, he has no idea how he got there. The stories all said the place was ruined by an earthquake, and Sand did not expect to find everything inside-from dishes to candles to apples-torn in half or slashed to bits. Nothing lives here and nothing grows, except the vicious, thorny bramble that prevents Sand from leaving. Why wasn't this in the stories? To survive, Sand does what he knows best-he fires up the castle's forge to mend what he needs to live. But the things he fixes work somehow better than they ought to. Is there magic in the mending, granted by the saints who once guarded this place? Unexpectedly, Sand finds the lost heir, Perrotte, a girl who shares the castle's astonishing secrets and dark history. Putting together the pieces-of stone and iron, and of a broken life-is harder than Sand ever imagined, but it's the only way to gain their freedom, even with the help of the guardian saints. 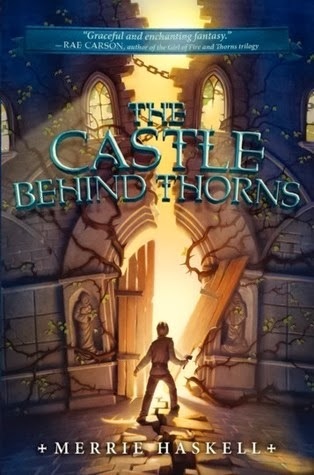 With gorgeous language and breathtaking magic, Merrie Haskell's The Castle Behind Thorns tells of the power of memory and story, forgiveness and strength, and the true gifts of craft and imagination. Thirteen year-old Sand wakes one morning in the fireplace of a broken castle, with no memory of the night before, and no way out. But his arrival is just one of the mysteries of the castle. First, the castle itself and everything in it has been rent in two – violently. It was clearly caused by some magical or miraculous event – but what? Second, there’s an impenetrable wall of thorns growing around the castle walls, and they’re not exactly a benevolent presence. Third, Sand discovers that the castle’s long-lost heir Perrotte is trapped with him. While Sand sets about doing what he knows best – mending the castle through his blacksmithing skills – there’s the matter of survival. These two will need to untangle history, myth and emotion to free themselves and set things right once and for all. Don’t be fooled: while this tale has the traditional castle-surrounded-by-thorns, it’s not a typical Sleeping Beauty retelling. The lovely mix of mythology, fairy tale, religion and medieval French setting is all its own. Unique too is the dual narrative structure, though Sand is certainly the focus. Sand misses his loving family, but he’s struggling to forge his own path and this brings him into conflict with his father. His removal to the Sundered Castle forces him to adapt to independence quickly, and to face a few choice facts. Young noblewoman Perrotte’s past comes back to her slowly, and emotion threatens to sweep her into rash action when it does. However, Sand’s presence and her interest in the natural sciences combined lead to growth, and eventually, a future she could learn to love. At the most basic level, they’re two adolescents making the transition to adulthood, and while they urgently need a way out of the castle, their time of isolation also gives them time to know themselves and each other. That’s the story, then. I enjoyed it, though it didn’t set my pulse racing – it’s a quieter sort of story (though not peaceful… there’s quite a bit of remembered violence). What really shines in The Castle Behind Thorns? Haskell’s writing and the world-building. Just A+ stuff! Haskell’s writing is like a mash-up of the best of Karen Cushman (The Midwife’s Apprentice) and Robin McKinley (The Blue Sword). It is finely wrought medieval fantasy setting plus fairy tale, magic and mysticism. I’ve never read anything like it (and I have read a lot of fairy tale retellings, folks). Haskell is breaking ground, but not in a flashy, plot-above-all sort of way – no, this is heart-driven, mythic storytelling with appeal for anyone who likes smart fantasy with layers of meaning (my preteen self would have loved this book and all of the female agency!). I’m not sure, rereading my review, that I have convinced you to pick up the book yet. Let me try again. My favorite things: Sand as a character – so grounded, perfect temperament for his chosen work, and yet not a perfect cardboard cutout ‘type.’ The inclusion of religious symbols, saints and miracles alongside magic. Real danger! Unkindness and tragedy paired with examples of strength and courage. Good parental figures, as well as ambiguous ones. Gray areas! And of course, a historical heroine interested in science. This one, in case you couldn’t tell, was a total winner. Recommended for: fans of Rosamund Hodge’s Cruel Beauty (don’t expect a romantic thread! ), Elizabeth Gray Vining’s Adam of the Road, Sherryl Jordan’s The Raging Quiet, and all-ages (10+) fans of beautifully crafted historical fantasy. You have absolutely convinced me, although I was pre-convinced because I've heard good things about this book from one or two other bloggers. It sounds great!